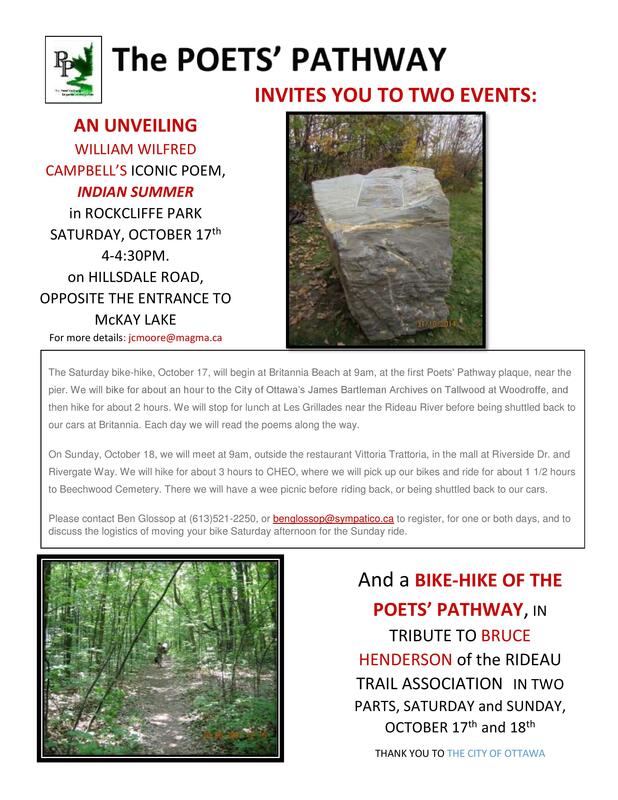 The Saturday bike-hike, October 17, will begin at Britannia Beach at 9am, at the first Poets’ Pathway plaque, near the pier. We will bike for about an hour to the City of Ottawa’s James Bartleman Archives on Tallwood at Woodroffe, and then hike for about 2 hours. We will stop for lunch at Les Grillades near the Rideau River before being shuttled back to our cars at Britannia. Each day we will read the poems along the way. On Sunday, October 18, we will meet at 9am, outside the restaurant Vittoria Trattoria, in the mall at Riverside Dr. and Rivergate Way. We will hike for about 3 hours to CHEO, where we will pick up our bikes and ride for about 1 1/2 hours to Beechwood Cemetery. There we will have a wee picnic before riding back, or being shuttled back to our cars. Please contact Ben Glossop at (613)521-2250, or benglossop@sympatico.ca to register, for one or both days, and to discuss the logistics of moving your bike Saturday afternoon for the Sunday ride.